ACC is committed to strengthening families by providing the highest quality care and education for children; serving families of varied economic levels and cultural backgrounds in an atmosphere that celebrates diversity. The ACC experience is designed to address each specific area of development within each child including social, emotional, physical, and intellectual growth. Research shows that successful adulthood is dependent on all of these, not just intellectual capacity. The ability to delay impulses and manage feelings, for instance, is critical for success. We believe that at this young age children can develop a solid foundation in all of these areas. Children progress through well-recognized stages of development in all areas of growth. The rate at which each child progresses varies, and even within the same child there are variations of growth. For example, a child can have advanced intellectual development, while lagging in social skills. We base our understanding of the developmental growth of children on the work of Jean Piaget, who studied how children acquire knowledge; Erik Erikson, who studied the social dimension of human growth; Stanley Greenspan, who charted the milestones of emotional development; and Lawrence Kohlberg, who marked the stages of moral growth. We are indebted to these theorists as we observe children and plan environments that help all children to reach their potential. ACC staff assess the children regularly to determine the most effective individualized learning strategies and provide them a balanced developmental plan appropriate for their needs. Children are aware of differences in color, language, gender, and physical ability at a very young age. Numerous research studies about the process of identity and attitude development conclude that children learn by observing the differences and similarities among people and by absorbing the spoken and unspoken messages about those differences. The biases and negative stereotypes about various aspects of human diversity prevalent in our society undercut all children’s healthy development and leave them ill-equipped to interact effectively with many people in the world. Consequently, our anti-bias curriculum seeks to develop every child’s fullest potential by actively addressing issues of diversity and equity in the classroom. ability to stand up for herself or himself, and for others, in the face of bias. We are grateful to Pacific Oaks College for their development of this approach and its application in the classroom. Research indicates that one of the most accurate predictor of academic success is the level of involvement of a child’s parents. 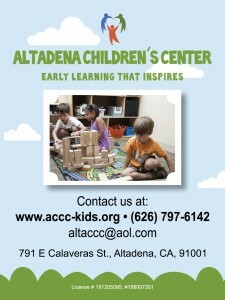 The ACC program actively involves parents and creates a unique sense of belonging for children and families. The greatest predictor of a quality child care program is a quality teaching staff. We are proud of our success in retaining caring and competent teachers. In fact, we have one of the highest levels of teacher retention in our community. Further, a recent evaluation by trained UCLA observers confirmed that ACC teachers outperformed other programs in their involvement in and support of children’s growth and needs. Read more about the ACC rating.